Like any business, you wanted more leads. HubSpot helped you get them. Now what do you do? Within HubSpot, there lies a treasure trove of actionable data. Tracking data is available for CTAs, Documents, landing page visits,emails, and more. With all that tracking comes data. A lot of data. While it’s nice to know who visited, clicked, viewed or shared your content, that knowledge isn’t doing much for your bottom line unless you know what to do with it. Here’s a few places you’ll find data that not only will make your marketing efforts look good, but will give you insight into which customers are really engaging with your content, and what’s making some deals close and others stall out at the top of the funnel. Want to quickly rank your contacts by likelihood to close? Try manual lead scoring. Don’t let ‘manual’ scare you off. Once you’ve (manually) set up your scoring criteria, HubSpot will automatically score your contacts for you. For instance, let’s say you classify a link click as worth 2 points. A bounced email is -5 points. And so on. Once you’ve set up your positive and negative criteria, you can turn on lead scoring, and know which of your contacts are most engaged with your content. Most engaged = most likely to close. You can use lead score in lists (remember those?) to quickly sort your contacts by those who are most engaged. By doing this, you can send email campaigns or set up call lists for your salespeople quickly and efficiently. Another powerful tool in your HubSpot account are the custom reports you can build across data sets. These reports can help you drill down on where your leads are coming from, what life cycle stage they’re in, and what content is driving them down the funnel. With this knowledge, you can put that data to work for you by using it to intensify efforts in areas where your reporting shows room for improvement, or double down on extremely successful campaigns. Documents is the cult favorite of HubSpot features. It’s as robust as any (more popular) option available, yet somehow still flies under the radar. Using Documents, you can know the moment a contact is viewing your PDF, how long they viewed it for, and which specific pages they read. This helps you gauge the quality of your ebooks by measuring engagement! Additionally, document views are tracked to specific customers and recorded in a contact’s records making this the perfect tool for funds to track interaction with offering memos and disclosure documents for example. 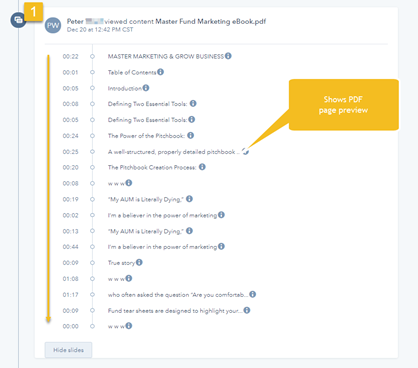 This screenshot shows a prospects engagement with our Master Hedge Fund Marketing ebook showing not only that he viewed the PDF, but how much time was spent on pages within the ebook itself. Documents can be shared from emails, sequences, and workflows. They can add more value than traditional file manager uploads, because the reporting goes so far beyond clicks. Once you have the data from your documents, you can use it to fuel future campaigns based around interaction with your content. Call to action. It’s one of the most basic tools in your marketing stack, at first glance. But, look deeper, and you’ll see that CTAs in HubSpot offer much more than just a place for your prospects to click. You can create smart versions of your CTA to display differently based on contact profiles, or A/B test your CTA to see which one drives more conversions. Additionally the same CTA can be used across your website and blog, email blasts, and even social media. A CTA will allow you to roll up all of these analytics into a single action point to measure its overall effectiveness. 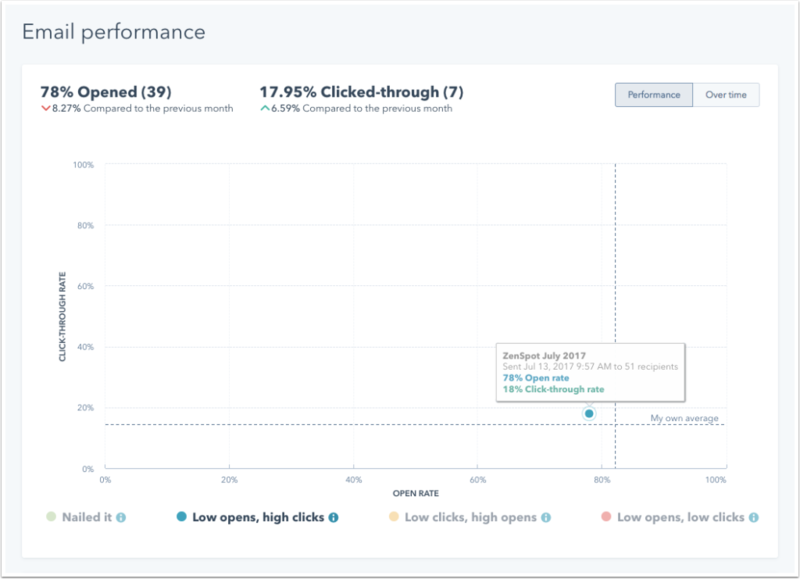 As always, you’ll want to analyze your CTA performance so that it can be further optimized. 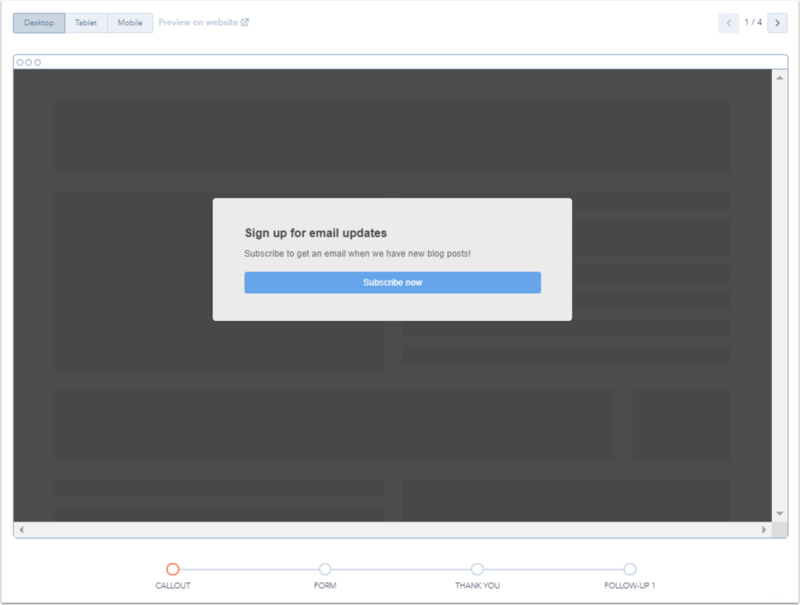 Pop Up Forms have been in HubSpot in one form or another for a while. That form used to be known as Lead Flows. Once you’ve used your analytics data to see which of your pages are either performing better than or less well than expected, you can deploy pop up forms. If a page has contacts bouncing off quickly, you can add a pop up form on exit intent to try to capture that lead. If a page is stuffed with content, and you’re worried a contact may not absorb all of it before getting to your form, include a pop up form to deploy after 10 seconds or so to quickly point their attention to a conversion point. The key is not just getting raw data, but finding weaknesses and strengths that you can use to see your progression as a marketer. Measuring your success with each template will help your sales team produce more results. Another obvious source of data is forms and you’ll find all the stats you’d expect including views and completions. However, HubSpot adds another advanced layer of data by being able to break out form data based on the page the form is on. This means if you have a lead gen form on multiple pages, you’re able to break down the stats by the page each form is actually on. You’ll be able to use that data to pull lists based on your contacts filling out a form on a specific page. That list then can be turned into an audience for your next targeted email, or an exclusion list from a continued workflow. Being able to see the direct path contacts are taking on their journey to closing allows you to move any obstacles that may be getting in their way from a design or content perspective. Knowing which pages are converting and why will be key to generating more form fills, and more leads. HubSpot is an incredible source of data to validate or optimize your marketing efforts. But that data won’t do anything for you just sitting in your account. Using the tools described above, you can take those data points and turn them into actionable strategies to capture and convert more leads. 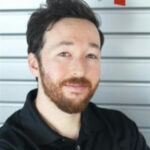 Ready to do more with your HubSpot account? Been staring at your reports for an hour and got kind of dizzy? Let’s schedule a call and we can get to the bottom of how your marketing is doing now, and how to make it better. Not familiar with HubSpot? Start here. All images in this post sourced from HubSpot.